The achievements of Bro-manity have been many throughout the years, but none has been as significant as the invention of the High 5. Click here to play! Said to have been used by Vikings - who were known to be Dudes among Bros - in order to seal deals, the High 5 has since evolved to celebrate many other situations. Practically any achievement of merit warrants a High 5, and it is considered to be particularly poor Bro-form to deny a High 5 when requested to celebrate a worth occasion. Prepare to celebrate this most highly respected hand gesture in the High 5 slots. 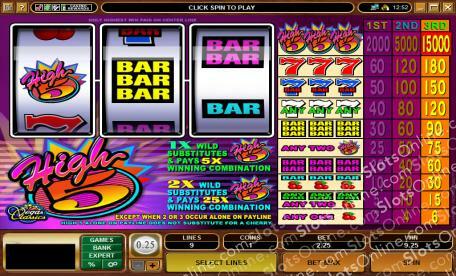 A set of classic 3-reel slots - classic like the High 5 itself - you can win up to 15000 coins on this game without having to leave your house. If someone denies you a High 5 after winning a jackpot like that, it is advised that you report them to the Bro-lice department immediately, lest their anti-Bro ways catch on and bring down Bro-ciety as we Bro it. If you think you are a bad enough dude to win a big slots jackpot, get you and your Bros over to the High 5 slots to play for red cherries, BAR symbols, lucky 7s, or a big High 5! The High 5 symbol is wild, and it substitutes for any other symbol making up a winning combination. Wild symbols alone do not count as cherries, however. When a single High 5 symbol substitutes to make a winning payline, the prize is multiplied by 5. When two High 5 symbols substitute to make a winning payline, the prize is multiplied a whopping 25 times!